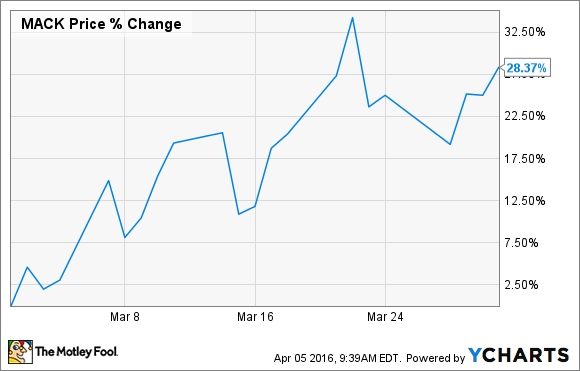 Merrimack Pharmaceuticals Inc Rose 28% in March. Here's Why. Shares bounce back from a rough start to the year. What: Investors in Merrimack Pharmaceuticals (NASDAQ:MACK), a cancer-focused biopharmaceutical company, had a great month. Shares jumped by 28% during March, according to data from S&P Global Market Intelligence. A SEC filing showed that one of the company's directors purchased $192,500 worth of the stock in late February for $5.50 per share, which was the first time an insider has made an open-market purchase in seven months time. The purchase looks like it was well timed as it came just a few days after Merrimack's stock dropped to near a two-year low. The National Comprehensive Cancer Network, or NCCN, has added Merrimack's pancreatic cancer drug Onivyde in its 2016 clinical practice guidelines for treating patients with pancreatic adenocarcinoma. The guidelines call for Onivyde to be used in combination with fluorouracil and leucovorin as a category one second-line therapy in patients who have previously been treated with gemcitabine-based therapy. Being included on the list could go a long way toward building awareness and support for the use of the drug. Add those developments to the fact short interest in Merrimack's stock has been on the rise recently -- more than 28 million shares are currently sold short, up from 20 million at year end -- and it's possible that the news caused a few traders to cover their short, sending the company's shares higher. Now what: The year ahead looks like it should be an exciting one for Merrimack's investors. The company and its partner Baxalta are getting ready to launch Onivyde in Europe if the drug gets the go ahead from regulators, which could prove to be a revenue bonanza for Merrimack. The partnership could allow Merrimack to earn up to $970 million in milestone payments plus royalties if all the conditions of the agreement are met, which is a huge number for a company with a market cap of roughly the same number. The company believes that Onivyde has an addressable market of roughly $800 million in the U.S. If the company is able to execute on its commercialization plan, then Merrimack could swing from a money-loser into a profitable enterprise in a few short years time, which would likely make Merrimack's current share price look inexpensive in retrospect.